The NHL is in an era now being hailed as the fastest, the youngest, and the most exciting the game has has ever seen. Young stars are emerging from non-traditional hockey markets and non-traditional hockey playing countries around the world, pushing the status quo to its limits and blazing a trail for more like them in the years to come. Translation: the NHL today is incredibly exciting to watch, perhaps now more than ever. However, this has led to negative strategies to increase scoring even more to appeal to fans. The League has attempted to capitalize on an uptick in scoring in recent years by reducing the size of goaltending equipment, effectively trying to make goalies worse and up the scoring even more. To this day, the League is working on more ways to make goalies smaller to create even more goals. The question I want answered is this: when will it be enough? 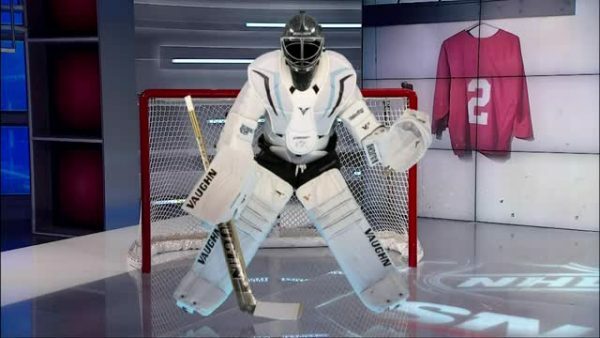 Recent memory serves to show that when it comes to goaltenders, the NHL has done virtually all it can to reduce the size of goaltending equipment in hopes of increasing goals per game across the League, a process they call “streamlining.” Streamlining equipment would imply it is becoming more efficient and more effective for those wearing and using it on a nightly basis. But given the response held by most of the goalie base in the NHL, equipment reductions haven’t accomplished that goal– at least not yet. To get a better grasp of exactly what efforts the NHL has made to “streamline” goalie equipment in the past number of years, let’s run through each and every important change that’s been made. Before the start of the 2013-14 NHL season, the League voted in conjunction with the NHLPA to approve a 10% reduction in the knee-to-hip allowance of the NHL’s goalie sizing chart, a reduction from 55% to 45% aimed to attain a 2″ reduction for every goalie, although that number fluctuated from a half-inch to more than 3″ depending on the goalie. For those who aren’t familiar with the technical lingo when it comes to goalie equipment, knee-to-hip allowance refers to how far the pad extends above the knee up toward the goalie’s waist. Less pad in that area would infer a more open five-hole, an area everyone knows goalies hate to be beat in. 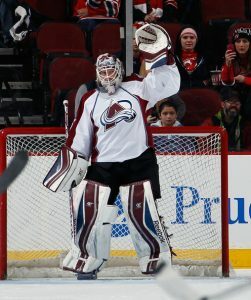 The initial response from goalies such as then-Avalanche netminder J.S. Giguere was largely negative, although much like most changes made in hockey, most of that subsided as the year went on. In addition to the reduction in knee-to-hip allowance, the width of the leg pads were shrunk to be an 11″ maximum depending on the pad size, and goalie pants were shrunk to be a bit smaller and more formfitting. The reason that goalies like Giguere were upset at the time of the change was that they saw this as a blatant attempt to increase scoring, or, in the eyes of a goalie, worsen their personal numbers– and this may very well be true. However, the unfortunate truth is that at the end of the day, the League and the majority of its fanbase aren’t going to pay much mind to 30-60 out of the 690 (circa 2014, before expansion) NHL players and their grievances. And so, this issue slowly dissipated and goalies got used to the new pads. Funny enough, goals per game actually went down, and goalies’ stats went up, the size reduction allowing for higher mobility and athletic save potential. This sizable reduction to goalies’ leg pads happened now five seasons ago. That’s quite a long time to assess the statistical advantages and disadvantages of the changes. Evidently, before the commencement of this current season, the League felt that goalie equipment needed to be altered even more, which brings us to the changes made for the 2018-19 NHL season. Before the beginning of this year, the NHL and NHLPA joint-mandated another wave of goaltending equipment changes, specifically for the arms and chest. Unlike player chest pads, goalies’ chest pads are one big piece with the arms attached. The NHL felt that these pads were too “bulky,” and gave goaltenders an unnecessary advantage over shooters. Therefore, the NHL and NHLPA agreed to streamline the chest and arms to make them more formfitting, seeking to make a goalie’s equipment “anatomically proportional” to the goaltenders themselves. Hellebuyck, Holtby, and Bobrovsky aren’t the only goalies that view these most recent equipment changes as negative. Among some others are Dallas Stars goalie Ben Bishop, and Philadelphia Flyers goalie Brian Elliott. They take an interesting stance in that they don’t necessarily denounce equipment changes, just encourage a second look at said changes because of injury concerns. No one, not even the League itself, wants to see goalies get hurt, and that’s why it’s worth further consideration. The NHL has been trying to figure out ways to increase scoring after an extended plateau of goals per game that lasted up until about last year. The thing is, though, that number of goals per game is going to fluctuate year to year either way, whether or not the League streamlines goalie equipment. Hockey is just that kind of game. And, just because goalies have become too good and too fast and are now forcing players to catch up to their skill level doesn’t mean streamlining their equipment is the only way to fix things. Goal scoring in the 2017-18 NHL season finished at 2.93 GPG among each individual NHL club, up from 2.73 GPG the year before. And this was before the most recent streamlining project. If they had left the equipment as is, I doubt we would have missed out on that much scoring thus far this season. However, the League and the Players’ Association made up their mind, and it looks like they’re going to stick with it for the time being. What happens down the road is anyone’s guess, but I would venture to say that they continue finding ways to shrink goaltenders as much as humanly possible. One can only hope that’s not the case.